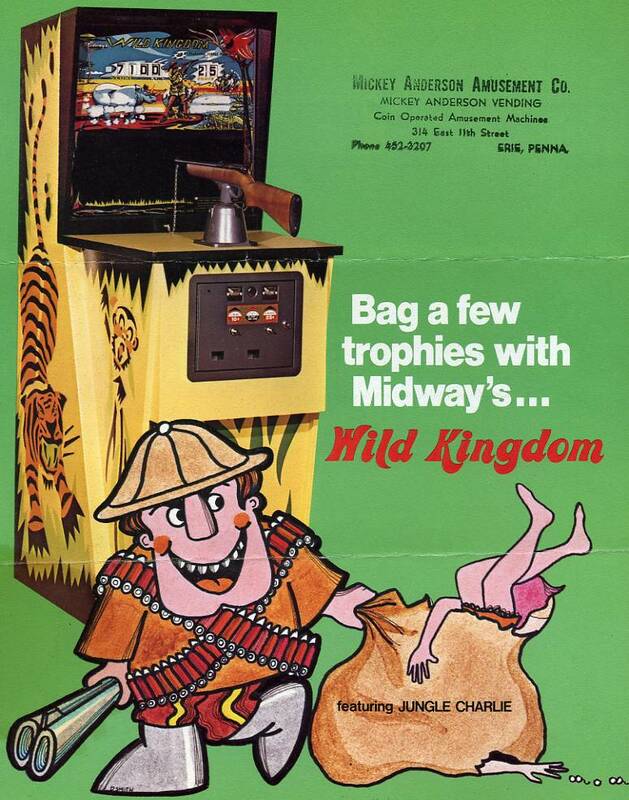 Description: Wild Kingdom, Midway #549, 6/71, gun game with wild animal theme, electronic sound and modified consumer 8-track player. Only one channel of the 8-tracks are used, just for background sounds (though four channels are recorded, but all with the same sound track). There is a manual switch on the consumer quality 8-track which plays tracks one to four (the switch can be on any track for the Wild Kingdom tape to play). The 8-track is really a cheap portable player with a 9 volt power jack and the ability to use six "C" batteries for power. It even has a carry handle on the top and a speaker inside. Midway however wired power and a speaker directly to the unit through a Molex connector, and disconnected the internal speaker. The game has four animal target styles: Leapers (two Zebras and two Antalope), an Elephant, an Alligator, and a Tiger. All are worth 200 points except the Leapers which are worth 400 points (maximum score is 6200 points based on 25 shots). The Leapers rotate in a circle with two of the four Leapers showing. When a Leaper is shot a solenoid makes the Leapers fall. 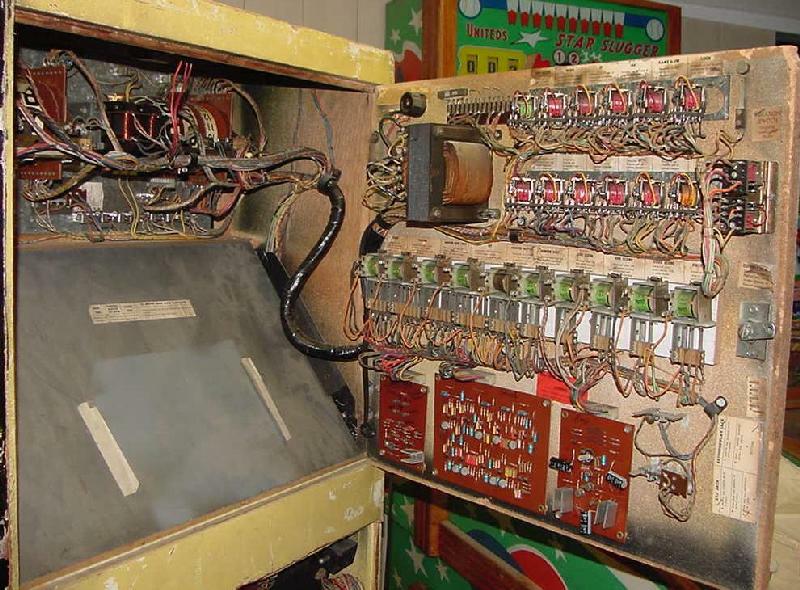 The Elephant constantly moves across the playfield width left to right (left & right speed is adjustable via two trim pots on the motor control board). 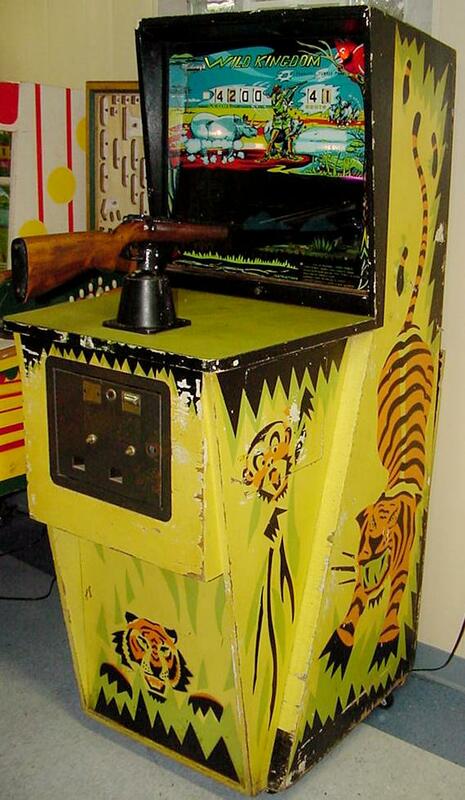 The Alligator and Tiger move from the behind a bush at the edge of the playfield to the center, and are stationary until they are shot (then they retreat back to the side). Only one animal target is available for shooting at a time (unlike say Haunted House where the player must choose which of the multiple targets to shoot at any time). When an animal is shot by the player it screams a distinct electronic yelp - there are four different electronic sounds (one for each animal type). Jungle Charlie and the player's electronic gun sounds are slightly different (there are also separate volume controls for these two gun sounds). If the player hits an animal, the game makes an unique animal yelp. If Charlie hits the animal, there is no animal yelp. The sound board has eight trim pots, six of them are for animal/gun volumes, and two are for sound amplitude on the elephant and tiger. 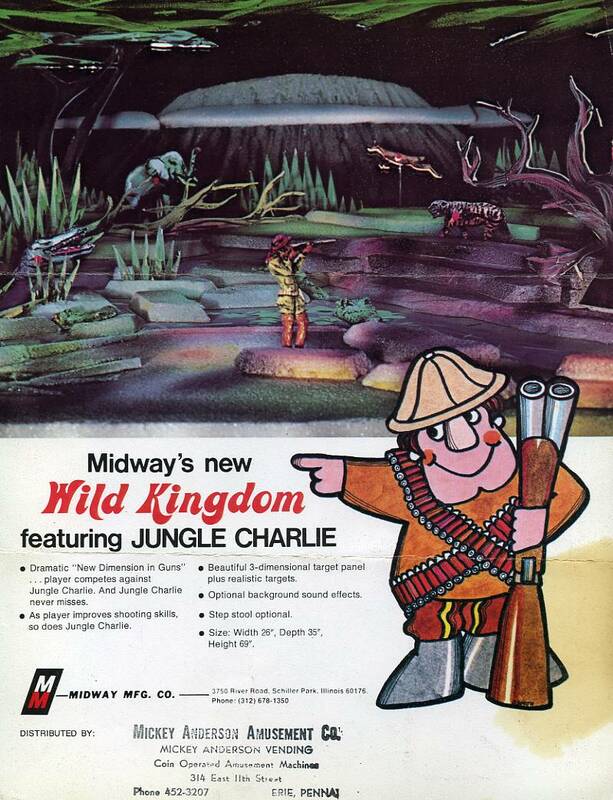 Midway's Wild Kingdom is a very challenging gun game because the player is shooting against "Jungle Charlie", a 3" high moving mechanical marksman on the game's playfield. Unlike say Haunted House where the player can take their time and shoot as slow as they want, Wild Kingdom forces the player to shoot fast. After the first shot is taken, the player is shooting against Jungle Charlie (the first shot is a 'warm up' shot and the player can take as long as they want for the first shot). 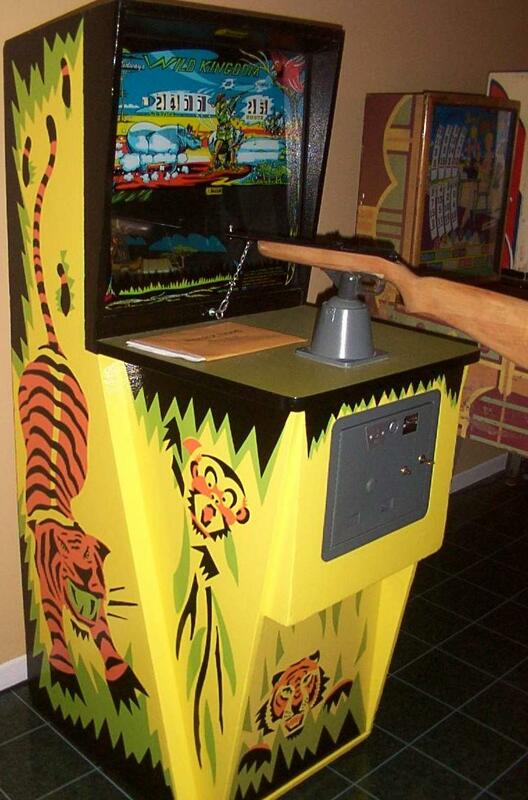 If the player takes too long to shoot, Jungle Charlie shoots the animal instead causing the animal to retreat, and Jungle Charlie *never* misses. 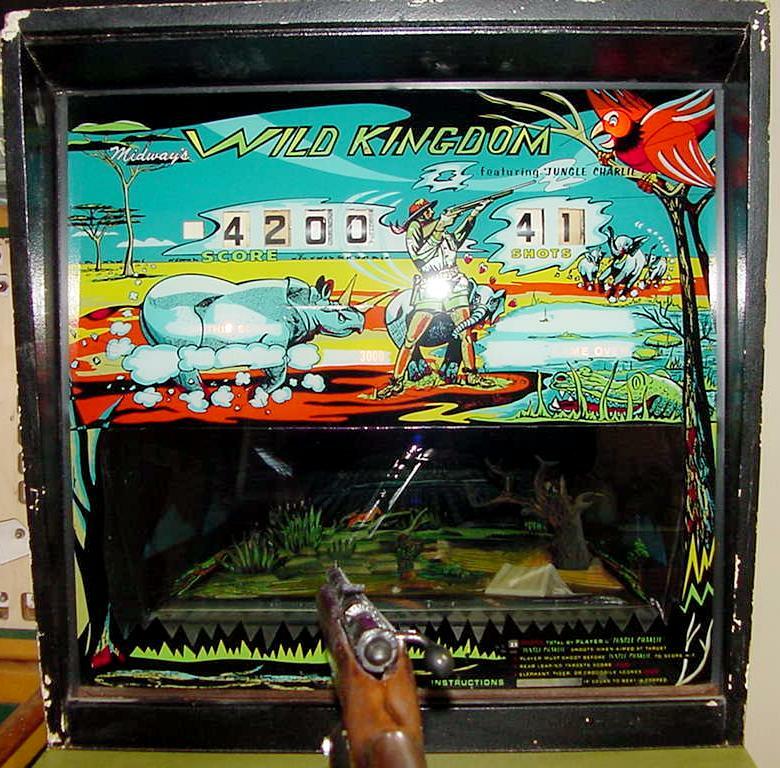 To slow Jungle Charlie, the player can fire his gun - Jungle Charlie can not shoot if the player is shooting (and likewise the player can not shot if Jungle Charlie is shooting). Each game gets 25 shots, with Jungle Charlie shooting out of the 25 shots. If the player is slow he may only get the first shot, and Jungle Charlie will use the other 24 shots! Jungle Charlie's movement speed can be adjusted. If he's adjusted too fast the game is nearly impossible to shoot as Jungle Charlie is too quick. At 3000 points the game automatically speeds up Jungle Charlie too. The game also has a "Top this Score" feature which randomly moves from 3000 to 6500 points (500 point increments). If the player can beat the top score, either a credit or extended play are given. If set to extended play, the a total of 40 shots are available per game (instead of 25). In this case the Top Score Relay energizes allowing the player an additional 15 shots. Depending on how Jungle Charlie is adjusted, this is extremely hard to achieve as 3000 points is the bare minimum needed for extended play. Midway Wild Kingdom construction is a cross of early solidstate and EM (Electro-Mechanical) technology. The early solidstate circuits are generally robust (though my game has an open resistor for Charlie's motor control making Chuck not work - I also replaced most of the larger electrolytic capacitors in the game). There is a circuit board for the sound, the amplifier, and the motor speed control, all mounted on the top backdoor. 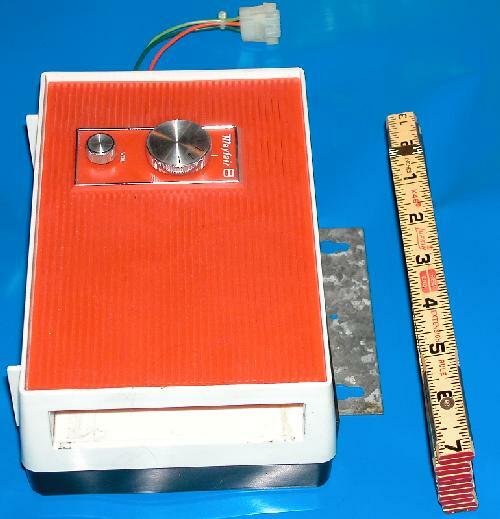 The bottom backdoor has a small rectifier board which converts 6 volts AC to DC power for the 8-track player using four diodes and a filter capacitor. The game uses Midway's standard motorized score reels. 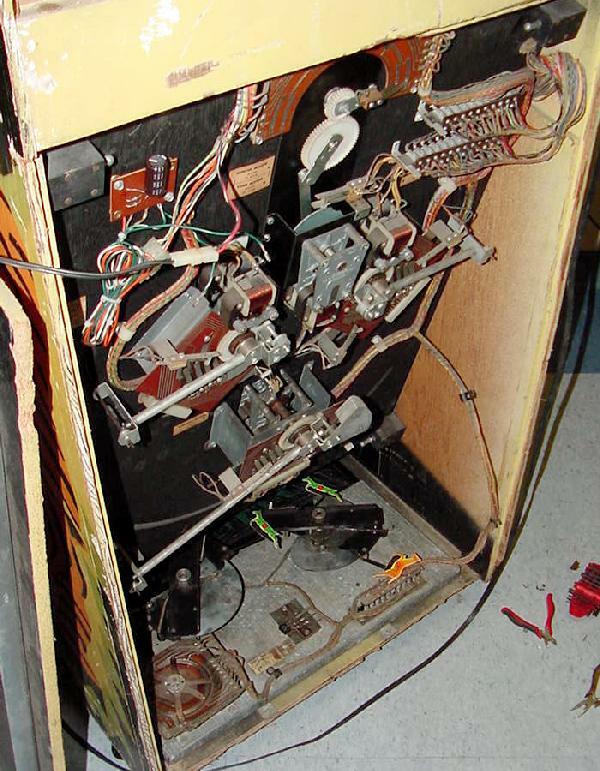 The stepper units for the game are largely part of the motorized score reels (there is only one other discrete stepper unit, used for the Leapers). MP3 of the Wild Kingdom sound track, thanks to Mark: Wild Kingdom sound (2.3meg). On my Wild Kingdom I had a number of problems getting it fully working. First the hunter (Jungle Charlie) did not work. On the motor control board there was a 15k resistor in the Charlie circuit which measured 110k. I replaced this resistor and adjusted Charlie's speed with the trim pot, and that got Chuck working. Next was the Elephant could not be shot by the player. Charlie could shoot the Elephant, but not the player. 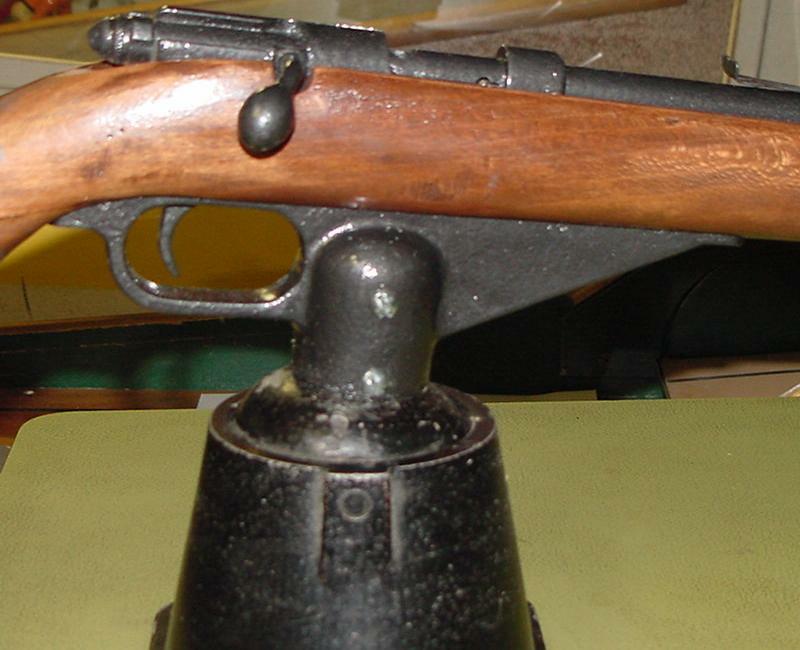 Two gun stylist wires on the Elephant relay were reversed. The last major hurdle was the 8-track player. It tried to work, but would not play the tape. I replaced the 8-track tape with a brand new one from Mark. This did not help. I took the player apart and examined the tape drive belt. It was stretched out and did not grip the cogs. I replaced the belt with a 2" pinball rubber, and this really helped. But the tape player still did not work well. Then I looked at the tape player's power requirements - it says right on the side it uses 9 volts DC to operate. But the tape player power board (on the lower back door) takes the 6 volts AC G.I. game power and converts it to 6 volts DC (through four diodes and a 1000 mfd cap) to power the tape player. This just is not enough power (8.5 volts DC unloaded, 6 volts DC under load). So replaced the cap with a 10,000 mfd unit, and wired in a 7809 voltage regulator. If 12 volts to 40 volts DC is powered to the 7809, it will output a consistent 9 volts DC. The Wild Kingdom transformer outputs 15 volts AC for another circuit. So I disconnected the white 6 volt power wire from its 6 volt source (a G.I. bulb socket under the score reels), and connected this white wire to the transformer's 15 volt power (adding another fuse holder below the others, and installed a 2 amp fuse). The 7809 is easy to wire to the board. I drilled three 1/16" holes in the tape player power board and inserted the 7809 voltage regulator. The center leg connects to ground (negative lead of the cap). Pin 1 (V-in) of the 7809 goes to the trace which connects to the orange wire. Pin 3 (V-out) of the 7809 goes to the orange wire (which is now disconnected from the previous trace). A large heat sink is required on the 7809 or it will thermally shut down. Now the tape player works like a champ! I also had to recreate one of my leepers. After printing it out on a color inkjet and gluing it to some cardboard, the florescent colors had to be painted by hand with florescent acrylic paints. That's because the blacklight would not light the inkjet inks, so the only choice was to paint the leeper by hand with acrylics. If this wasn't done you could not see the leepers at all under the blacklight. 4200 points! That's the highest score I have ever gotten. sometimes cheat the game for one extra shot if you fire quickly). The trigger guard/attachment point. Usually this is plastic and often cracks. as I need it for another Midway gun game I have. A restored Wild Kingdom by Dave.